Authentic olive oil is the only olive oil that you should consume. Although, understanding where to find and buy authentic olive oil has become very tricky lately. Shockingly, extra virgin olive oil has been watered down by canola and other inferior oils pretending to be "real" olive oil. If you're lucky enough to live in a warmer climate with olive trees, you can learn how to make olive oil yourself. That way you'll know your getting the "real" thing! Authentic olive oil comes with numerous health benefits and this type of olive oil has been a favorite of many Mediterranean cultures. In the United States, California and Arizona are a couple of states with the right climate to grow these life giving trees. How to make olive oil is really pretty simple. Olive oil is made by crushing and macerating washed olives into a paste. This paste is then pressed to separate the oil and water from the solids. Then the water is removed leaving behind the olive oil - which is then bottled. Olives are one of the rare fruits that can be pressed "as is". This rare quality only adds to the taste, aroma, special nutrients, and antioxidant properties of authentic olive oils. Authentic olive oils come from the fruit of the olive tree which is commonly found in the Mediterranean regions of the world. This healthy oil is made by pressing the whole fruit and doesn't come from just pressing the seeds like with other oils. 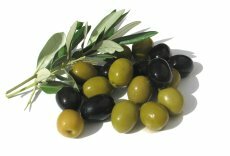 As olives ripen, they change from their green color to a light brown and then move on to darker colors like purple. Fully ripened olives will turn black. Authentic olive oil can be made by pressing any of the different colored olives - even the green unripe olives. Greener olive oils made from pressing green olives will have a slightly bitter and more pungent flavor. Golden olive oils made from pressing riper olives usually have a smoother and more buttery taste. What are Virgin Olive Oils? The different types of virgin olive oils will all be made from the first pressing of the olives. Chemicals and high temperatures are not allowed in the production of any of the different types of virgin olive oils. And there is no further refining that will occur after the first pressing is done. Also, none of the different types of virgin oils are allowed to contain any refined olive oil. The main differences between the different types of virgin olive oils will be their taste, aroma, and acidity level which is what determines a great olive oil. Olive oil is graded by its level of acidity or free oleic acid. The amount of free oleic acid in olive oil will indicate the extent to which fat has broken down into fatty acids. This type of olive oil will have the best overall flavor and will have an extremely low acidity level (as low as 0.225%). Premium extra virgin olive oils come with many delicate nutrients and should not be used for cooking at all! Premium extra virgin olive oil is best suited for use as a topping, salad dressing, or used as a dip for your bread. This type of olive oil was created to distinguish the authentic extra virgin olive oils from the "fakes" - which has grown exponentially! Ultra-premium is the new standard for the freshest and finest olive oils in the world! The content of this olive oil is 100% only from olives. And the crush or harvest date will be displayed on the bottle. This type of olive oil has a superior flavor and should contain no more than a 0.8% acidity level. Some regulations have the acidity cut-off point at 1%. Like premium - extra virgin olive oil is best when used uncooked. This type of olive oil will have a good taste and an acidity level of no more than 1.5%. This type of olive oil is less expensive than the extra virgin olive oils, but is close in quality and is good uncooked. This type of olive oil should also have a good taste and its acidity level must be 2% or less. Virgin olive oil is good for cooking and can also be enjoyed uncooked. This type of olive oil doesn't have the best flavor and will have an acidity level no higher than 3.3%. Semifine virgin olive oil is good for cooking, but not so good for dipping your sourdough bread into. When olive oils are considered unfit for human consumption because of acidity levels greater than 3.3% or because they have an unpleasant taste, they are further refined with chemicals, heat, and/or filtration. Refined olive oils are no longer considered virgin olive oils or authentic olive oils. These olive oils are tasteless, odorless, and will have an acidity level of 0.3% or less. Refined olive oils will have a longer shelf life and a higher smoke point. "Pure olive oil" and "olive oil" are typically a blend of refined olive oil and a small amount of virgin olive oil. 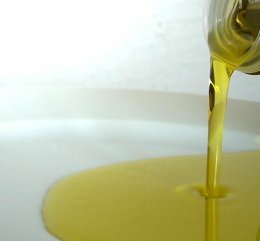 Are "Light" Olive Oils Authentic Olive Oils? Light olive oils have gone through an extremely fine filtration process usually with the use of heat and solvent chemicals. They are basically a refined olive oil that has had many of its healthy properties removed. The filtration process removes most of the natural color, aroma, and flavor of the olive oil which makes them suitable for high temperature cooking. Typically light olive oils will contain other oils like canola. 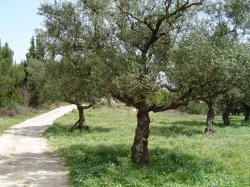 There are many regions in the world that grow many different varieties of olives and each place will have a unique tasting authentic olive oil. Usually, the best olive oils will come from small estates and farms that follow "organic" farming practices where the olives are hand-picked, pressed, and bottled on site. The best authentic olive oils are extracted using a cold process and will come from the first pressing of ripening olives. Higher quality olive oils will be the least processed or "unrefined". These olive oils will contain higher levels of vitamins like vitamin E and antioxidant polyphenols. Be sure its only 100% olive oil that comes in a dark bottle to help prevent oxidation. There should be a harvest or crush date on the bottle as well. You want to buy olive oil that was produced no longer than 14 months from the harvest or crush date to get the most health benefits from olive oil. Beware of "fake" extra virgin olive oils which have become a big problem especially among extra virgin olive oils sold by middlemen. A 2015 study found that 6 out of 11 extra virgin olive oils on store shelves were not extra virgin olive oils - but counterfeit products. Unfortunately, many olive oils labelled as extra virgin are actually being cut with inferior oils pretending to be authentic olive oil.